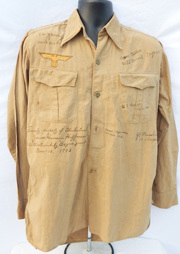 WWII U-Boat Skipper Hermann Hoffman's Captured And Signed Kreigsmarine Tropical Issue Shirt. 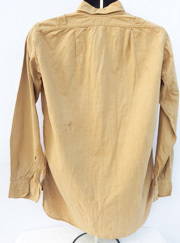 Standard issue tan pullover two pocket, long sleeve shirt. Above the right chest is a Tropical Kreigs eagle. Still has the should board loops. 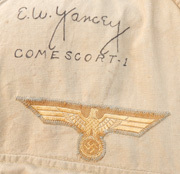 Hand written in ink on the shirt is FORMERLY PROPERTY OF OBERLEUTNANT ZURSEE HERMANN HOFFMANN C.O. U-BOAT SUNK BY BOGUE GROUP DEC - 13, 1943. It is then signed by the five US Navy ship commanders that chased him and finally captured the U-172 near the Canary Islands. Hoffmann was 22 years old when he became the skipper of the U-172. Inside the neck are the makers stamped. We have owned this one for a long time and decided we didn't need it any longer ( actually I got something cooler to put in it's place). This is an amzing piece of Naval history. Below is a link about the U-172 and Hoffmann.